Hard water is a very common issue faced by many homeowners and renters who live in high sediment areas. Your water can be considered “hard” when elevated levels of dissolved minerals are present in it. 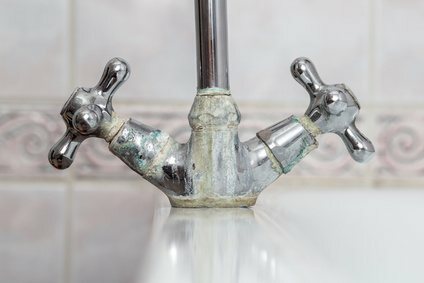 Although hard water is not unhealthy for human consumption, it can damage and even ruin your plumbing. This damage can happen to your hot water heater, dishwasher, washing machine, and your other household appliances. Placing small fixtures (like shower heads) into a bowl of hot household vinegar will dissolve the calcium deposit in about an hour. Distilled vinegar can be used to combat the white film and spot problems on your appliances and dishes. It will kill mold, bacteria, and germs as well as clean your dishes through regular wash cycles. Hot water encourages calcium to build up within your water heater. Reducing the temperature of your water heater will help delay and even reduce that accumulation. It is also important to have your water heater periodically flushed to avoid having sediment clogging it up. To reduce hard water deposits on your glasses and dishes, you can use a product similar to Lime-Away. These kinds of products work to remove years of buildup, stains, and film from hard water. For soap scum that is built up through the combination of soap and hard water, rinse with a 1:3 mixture of apple cider vinegar and filtered water should do the trick. The best solution to protect all of the pipes and appliances in your home over the long term solution is investing in a hig h-quality whole house water softener. There are salt-free water softeners that are environmentally friendly and remove the hardness in your home’s water without harsh chemicals or salt compound.